By 1929, Karl Hoblitzelles Interstate theatre chain had become one of the largest and most respected chains in the Southwest. Dallas, San Antonio, Austin, and Houston all had their own Hoblitzelle Majestics, the latter being home to three consecutive ones. Each of his theatres strove to offer the best in wholesome entertainment, in an atmosphere of clean, safe comfort, and in the process, brought respectability to motion picture entertainment. Houstons grand Majestic of 1923 remained the companys major showplace for the city, drawing crowds as the depression ran its course. With the end of the depression came the first of the Interstate neighborhood theatres, beginning with the North Main Theatre at 3730 North Main. It opened on Christmas Day, 1935. The North Main was followed by the Tower and Eastwood theatres. Interstate continued to expand its line of new theatres, as well as acquisitions and 50/50 partnerships with older independents. In 1938, Interstate opened the Yale 3906 Washington, adding another movie house to an area that already included the North Main and the Heights. 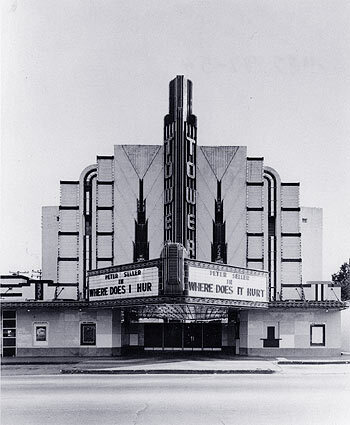 From 1938 to 1942, Interstate opened a new theatre each year in Houston. 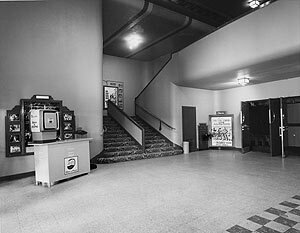 The entry for 1939 remains the best surviving example of Interstates theatre architecture of the period, and perhaps is fitting that it opened in the Hollywoods true golden year  the Alabama Theatre. The success of the Alabama was followed up 11 months later with the smaller-sized Almeda Theatre. 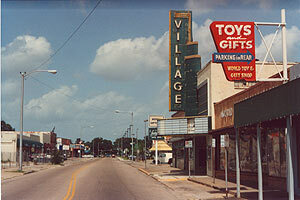 Then came the Village, Wayside, Santa Rosa, Broadway, Garden Oaks, and Fulton. The Yale lobby, with the sloped floor at the front. Note the poster display for the Ben Hur Horses at the Houston Rodeo (at the time held at the Coliseum). The Village Theatre, in the period between its operation as an X-rated house and its demolition. To its right, the beloved World Toys and Gifts. 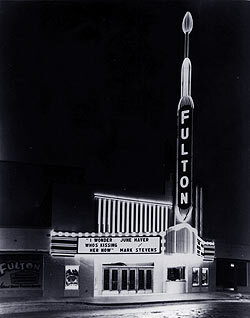 The Fulton Theatre in 1947. For many Houston children, the high point of the weekend was Interstate's Saturday morning Popeye Club, later simply called the Saturday Fun Club. 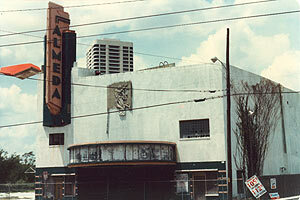 The Almeda Theatre in the eighties prior to its demolition. 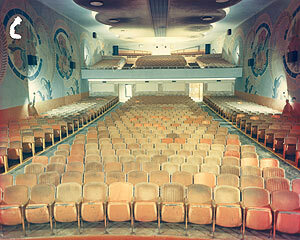 The Broadway auditorium in later years.